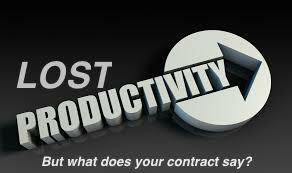 I have previously discussed the challenges a subcontractor has in proving a lost productivity / inefficiency claim. Besides being difficult to prove, subcontractors generally enter into subcontracts that include onerous provisions that foreclose a subcontractor’s right to pursue lost productivity / inefficiency claims. General contractors try to account for these types of delay-related claims by including provisions in their subcontracts that require subcontractors to fully bear this risk. An example of this ocurrence can be found in the opinion entered in Electrical Contractors, Inc. v. Fidelity & Deposit Co. of Maryland, 2015 WL 1444481 (D. Con. 2015) where the trial court precluded a subcontractor from recovering lost productivity / inefficiency costs based on the language in the subcontract that precluded such claims. Additionally, and importantly, the trial court found that that the subcontractor failed to timely notify the general contractor of its claims under the strict notice provisions of the subcontract. In this case, the general contractor was hired by a state agency to construct a laboratory building and furnished the state a public payment bond. The prime contract contained a construction schedule (which is not an uncommon exhibit in a prime contract). The general contractor then entered into subcontracts with trade subcontractors including the electrical subcontractor. An exhibit to the electrical subcontract was a schedule that simply reproduced dates applicable to the electrical subcontractor’s scope of work that were included in the construction schedule attached to the prime contract. No different than any baseline construction schedule on any construction project, it was not written in stone. This meant there were updates to the schedule that were furnished to the state agency and the state agency unsurprisingly challenged or opposed numerous schedule updates. The general contractor did not keep its electrical subcontractor apprised of the back-and-forth between it and the state agency involving schedule updates (nor was the general contractor under any real obligation to do so). And, as we all know, the schedule of the project is really driven in the field. So, as the construction progressed, the general contractor’s superintendents directed the electrical subcontractor to perform work in a piecemeal and unsystematic manner. This was due to work areas not being ready for the electrical scope due to delays on the project. The electrical subcontractor notified the general contractor that it was being impacted and forced to work unproductively. Thereafter, the electrical subcontractor sued the general contractor and the general contractor’s payment bond sureties for damages that included lost productivity / inefficiency damages. Electrical Contractors, Inc., supra, at *6 and *7. Electrical Contractors, Inc., supra, at *8 (internal citations omitted). While the 7-day claim notice requirement may seem unfair, the court explained that the electrical contractor was a sophisticated entity that knowingly assumed this notice obligation. These subcontract provisions recited above are not uncommon provisions. They are rather commonplace with sophisticated contractors–there is no real shock value when looking at these provisions, right? If you are a general contractor that includes such provisions in your subcontracts, this case gives you reassurance as to those contractual provisions that are aimed to insulate you from a subcontractor’s delay-related damage and require the subcontractor to give you timely notification of a claim (so that you are not prejudiced by the late submission of a subcontractor claim). These are important provisions for a general contractor to include in a subcontract and the provisions referenced above are certainly well-written provisions to model. It is understood that a schedule is never going to be written in stone and there will be logic and sequence changes in the schedule, so protect yourself by including such provisions (including the no-damage-for-delay provision). As you can see, there is value in doing so. On the other hand, if you are a subcontractor, if you accept these provisions, you need to either account for these risks in your subcontract price and/or bear the risk that these provisions may be appropriately enforced against you as shown in this case. Alternatively, and as the court alluded to, as a sophisticated party, you have the option of not signing the subcontract or trying to negotiate the best subcontract for you with an understanding as to those onerous provisions and risks that you choose to accept. This entry was posted in Contract Drafting, Delay Damages and tagged claim notification, claims, construction schedule, delay damages, inefficiency, lost productivity, no damage for delay, notice provision, schedule update, subcontract by David Adelstein. Bookmark the permalink.